Priests in eastern Congo are vowing to continue their work in parishes, schools and clinics after the murder of a priest in the largely lawless region. Source: Crux. Priests and Catholic churches have long been the target of violence in the area. The April 8 killing of Fr Etienne Nsengiyumva, a parish priest in the Goma Diocese, was the second murder of a Catholic priest by militias in the last three years. A third priest was shot dead in 2010. Also this month, Fr Celestin Ngango was abducted as he prepared to leave his parish after Easter Sunday Mass; he was later released. His abductors had called his parish to demand $644,000 (US$500,000) in ransom and later revised the figure to $64, 400 (US$50,000). 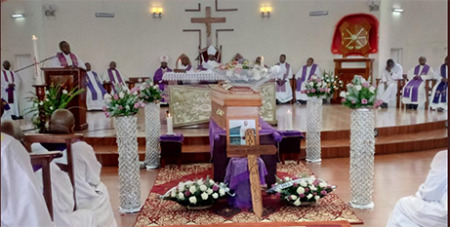 Fr Nsengiyumva, 38, was killed after he celebrated Mass at his small church. The gunman picked him out of a group and told him to stand up straight, Fr Arsene Masumbuko, another priest who works in the diocese, told Religion News Service in a telephone interview. Church sources say the killings are revenge attacks by militia groups in the region, who want to silence priests and pastors for criticising their abuses and plunder of local resources. “Priests are living in fear, but they cannot leave the villages where they are with the people. They are running schools, hospitals and peace programs. They are the only hope,” said Fr Masumbuko, who works for Caritas in the region. Part of Fr Nsengiyumva’s mission was to reconcile conflicting communities in the area, where many ethnically-based militias operate, Fr Masumbuko added. Elsewhere in Congo, Catholic bishops have recently been targeted for opposing President Joseph Kabila’s illegal extension of his second term, which was supposed to end in December 2016.